Clean and rinse lentils, removing all rocks and broken beans. Set aside. In a small pot, add the water and salt. Bring to a boil. Add cleaned lentils and bring water back to a boil. Place a lid on the pot and lower the heat to low. Simmer for 40 to 45 minutes. You don’t want them to be mushy at all. Remove from heat and drain all the water. Rinse beans under cold water, then place them in the fridge for an hour to cool completely. In a large bowl, mix the feta cheese, avocado, red onion, cilantro leaves and tomatoes. Add lentils and mix well to combine all ingredients. In a small bowl, whisk the lime juice, olive oil, salt and pepper. Pour dressing over lentils. Mix to combine. Do not overcook lentils, because they’ll become mushy. Nicole M. Presley People get all wrapped up in green salad and forget that a whole array of other salads exists. 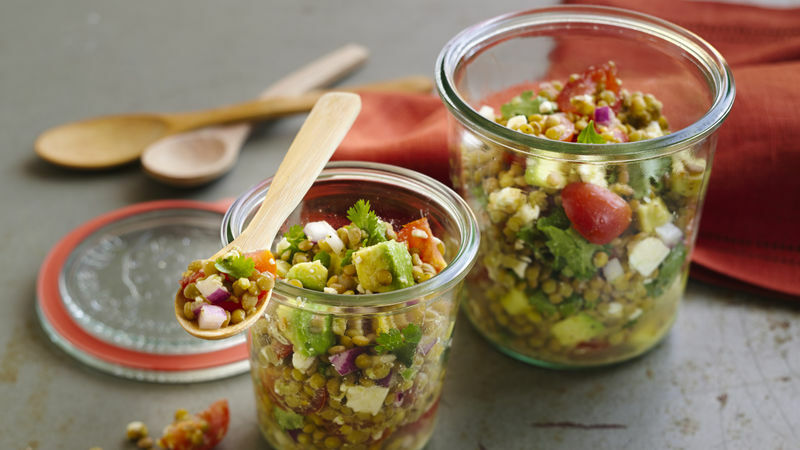 For some reason, the lentil salad gets lost in the crowd or people only think to serve lentils warm. This holiday season, I decided to bring it back to the table and serve it cold. The feta and avocado add a nice texture and taste to this bean salad. It also works well with other dishes, tying the whole meal together.